There is just something about the scent of Vanilla. Some people tend to focus on the pleasant childhood memories associated with the smell of vanilla, it's comforting milky warmth. Vanilla is sweet, reminiscent of childhood, gentle, warm and welcoming. Psychologists and medical researchers were aware of our positive reactions to the scent of vanilla long before perfume makers recognized its potential. In experiments where an odor universally regarded as ‘pleasant’ is required, vanillin has been a standard choice for decades. 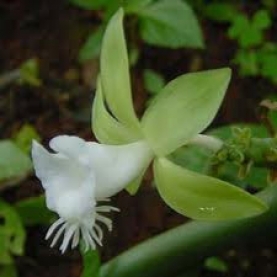 Medical experiments have shown that vanilla fragrance reduces stress and anxiety. Cancer patients undergoing Magnetic Resonance Imaging – a diagnostic procedure known to be stressful – reported a massive 63% less anxiety when heliotropin (a vanilla fragrance) was administered during the procedure. Vanilla fragrance makes you calmer. A study at Tubingen University in Germany showed that vanilla fragrance reduced the startle-reflex in both humans and animals. The animal results indicate that the calming effects of vanilla may be due to some more essential property of the fragrance than the ‘positive childhood associations’ usually invoked to explain its universal popularity with humans. Stillpoint Aromatic's Vanilla Oleoresin is produced using alcohol as the solvent. Once the essential oil and other natural constituents of the vanilla seeds are dissolved into the alcohol, the alcohol is removed. Vanilla Oleoresin is more concentrated and is thicker in consistency than traditional vanilla extracts and much thicker than vanilla absolute.